Give Toyota credit for making enough innovations that it now has a reputable Corolla hatchback. Squeezing into the lineup of the Japanese automaker is the all-new 2019 Toyota hatchback, which replaces the Corolla iM. Knowledgeable Toyota folks know the iM was a derivative of the unpopular Scion iM. Toyota shelved not only the iM, but the entire Scion brand for good in August 2016. The 2019 Toyota Hatchback has a new engine, a peppy 2.0-liter, four cylinder that generates 168 horsepower and 151 pound-feet of torque. The redesigned Corolla hatchback has a new engine and transmission, upgraded safety, and a generous list of standard features. It comes in two trims, the base model SE and the impressive XSE trim. Note that Toyota still offers the Corolla as a compact sedan. Eight years after it debuted in 1966, the Corolla became the top-selling car in the U.S. Toyota announced that sales reached the 40-million mark in 2013. Celebrating its 50-year anniversary last year, sales are now approaching 45 million. The Corolla is known as the quintessential economy car – inexpensive, reliable, fuel-efficient and easy to drive. It’s reliable as heck and possesses many enviable qualities, which is why it’s always been a great choice for all ages, ranging from teens to retirees. Yet the Corolla has also frequently been labeled as boring. So, when recently presented with the latest Corolla hatchback we were happy to see the boring tag will have to be lifted. The light-blue colored Corolla was not only visually appealing, we found it rather fun to drive as well. Part of that was due to a 6-speed manual transmission that gives the hatchback some pep and also keeps the driver engaged. There’s a noticeable difference in the engine when comparing the iM hatchback to the latest version of the hatch. 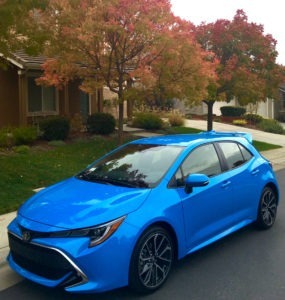 The 2019 Toyota Hatchback is a 2.0-liter, four cylinder that generates 168 horsepower and 151 pound-feet of torque. That’s 31 more horsepower than the iM. While no speedster going 0-60 mph, the manual version has been clocked at 7.5 seconds, just over a second faster than the automatic transmission. The new hatchback is also more fuel efficient, getting between 30-38 mpg, a couple more than the iM version. Although not exactly sporty, the Corolla hatchback is fun to drive. It’s fairly quick and in most situations gives the driver a good deal of confidence. It corners well, the steering is light, and there’s solid overall driver feedback. The interior has been improved as well. Although not big on technology, the tradeoff is the new hatchback has a good overall design and much of the interior is intuitive, so there’s little guesswork in operating the 8-inch touchscreen infotainment system. There’s good overall room and comfort in the front seat and the back has better than average leg and head room. Cargo space is 23.3 cubic feet.